“You’ve got a global—a set of global networks—that Al Jazeera has been the leader in, that are literally changing people’s minds and attitudes,” Clinton told members of the U.S. Senate Foreign Relations Committee. 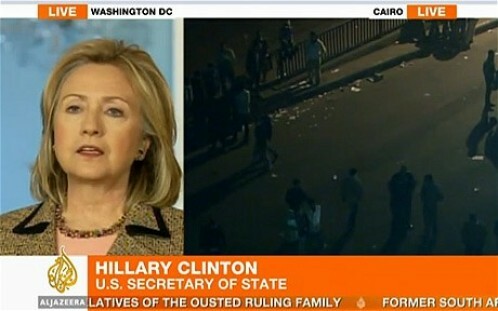 “Viewership of Al Jazeera is going up in the United States because it’s real news,” Clinton said Thursday. So what is it about Al Jazeera (“The Peninsula”) that’s won grudging praise from Hillary who admits that American news organizations are unable to inform and who implies that officials watch the network far more than they would admit? To me, it’s not just about organizational and technical matters of global network or lack of commercials or format or, thankfully!, the absence of talking heads and assorted poseurs who essentially know nothing about, say, the Middle East region, much less their country’s actual behavior and how it’s perceived and experienced by the world outside. Nor is it about American professors of media and journalism talking the anodyne language of the press or media in society, their analysis, understanding, and perceptions limited by their cultural provincialism. Or Charlie Rose show-type chatter by American journalists conversing on the intrepidness of, yes, American journalists uncovering, oh such amazing stuff, heroically, even romantically reporting from faraway (embedded) battlefields, essentially saying little and assuming a default American innocence. Is it the network’s smart studio layout and production sophistication, its multicultural awareness employing white, brown, black, Asian anchors and reporters? Its dignified, intelligent, poised, bilingual/multilingual, Arab female anchors and reporters, a curious site to those who only know of the oppression of Arab women? Its in-depth special reports and programs, such as “Empire” and “Witness”? The apparent, perceived crisp intelligence of spoken British-English of most of its anchors and journalists? The authentic experts, from America to the Middle East to China, consulted on every conceivable topic in every part of the world? It’s probably all those things, real and perceptual, but it’s also something deeper. The reality is that even free media reproduce their own cultures—their prejudices, biases, their Weltanschauung, even though they try hard, we assume, to report facts and be objective. American media reflects the American’s way of seeing and apprehending the world, and that’s essentially through an American nationalist lens. Add to this the fact of corporate ownership that has limits on deep, critical, reporting and analysis of America’s dominant financial and economic institutions, and you have quite uninteresting and uninformed reporting. Al Jazeera is also not free from cultural limitations, and if it seems, on its reporting of American policy in the Middle East or Palestine, biased, it’s reflecting the region’s world view (and I dare say much beyond)—and of course what seems like criticism to American officials is quite objective to the rest of the world. Al Jazeera’s superiority is, to me, a matter of seeing, understanding, and perceiving at many levels that the vast majority of Americans typically cannot. Al Jazeera is emblematic of a more complex, contextualized understanding of life representing, for lack of better term, a third world or perhaps old world view. We Americans, unlike Europe or the rest of humanity, have not experienced revolutions or transformations of regime, violent class conflict, genocide, tyranny, religious wars, wars on our soil (with the exception of the Civil War), occupation, suffering and so on. We had our revolution and it’s all been linear progress and plenty since—or so that’s how we perceive our history. We believe our country’s actions are always benevolent in nature and purpose, even beseeching the world to emulate our success. We don’t easily relate to the idea of a nexus of power between economic and political elites, how those privileged determine much of what goes on in the vast majority of the world’s societies, economies, and polities. We tend to see the “free market” as a panacea for all ills, an abstract totemic thing we virtually worship, a replacement of moral, public, and civil society space. The right wing radio talk show wing nuts even believe that American media is hopelessly leftist and liberal and socialist and anti-American, for everything about us is right and just and good. We are a profoundly status quo nation, hardly comfortable with revolution and fundamental questions and critiques of socio-economic and political change yet proudly insistent that we were born of one, revolution that is. Our media is like our movies, pitting good against evil, hero against anti-hero, usually narrated with a happy-ending, typically portraying, along with ubiquitous commercials, a fantasy America populated with affluent people with nice homes and cars and vacations and gadgets and happy children. News, certainly 24-hour news, is ideally supposed to educate, inform, edify, offer a new perspective, a new way of seeing an issue or others. Instead, American news has that inescapable quality of entertainment about it. Also, the idea that our nation is motivated by anything less than noble goals and delusions of benign American power out to do good is profoundly rooted in American culture, and it shows in the news. We don’t act ideologically, like “communists” and “socialists,” we don’t have “ideology,” but merely wish to bestow our great values, freedom and democracy, on the rest of the world. We are impatient with detail and complexity, with nuance and context in understanding social movements and histories. We apply military power for good. Americans will fiercely hold on to their core myths regardless of the reality. How we see the world, based on our own experience, is how we, the mainstream media, report it. President Obama and first lady Michelle Obama, because of the legacy of the black experience, see at many levels that which white Americans, part of the dominant majority worldview, generally cannot. They get it, including, I’m willing to bet, the issue of Palestine, as does virtually every black American I’ve spoken to about this topic. Oppression, exclusion, marginality will do that; will make one far more aware and perceptive of life and the other guy, the guy who has power and is in control. In the end, Al Jazeera’s journalism is one of depth, nuance, and context that American media simply cannot replicate. Al Jazeera producers, hosts, anchors, reporters—Arab, European, Asian, and African—do apply context and depth (as do American reporters who absorb Al Jazeera’s organizational culture and mission). They come from societies with a thousand year history; they get it. Consider Anderson Cooper’s enthusiastic reporting for freedom and good and anti-tyranny in Egypt and Libya. A great thing to be sure, but notable for its naivete, its form over substance, its lack of meaningful observation or insight, its inability to go beyond the surface, its reliance on in-house experts. This is typical of American media. Contrast this with a typical field reporter for Al Jazeera (Arab or European), who can relate from her/his own experience and background, understands at deeper levels the discourse of “state” and “society,” the meaning of authoritarianism, dictatorship and monarchy, the complexity and cynicism of human behavior, the importance of religion or spirituality in human, including Muslim, life, the role of money, wealth, class in the unfolding of political and social change. In this way, Al Jazeera’s reporting and specials anywhere in the world, particularly the third world, contain unique critical analysis and reporting. It’s “real news,” as Hillary has it. Al Jazeera minces no words about its advocacy for liberalization and change in the Arab world, and of course it’s been signally instrumental, along with the Internet, in this regard. I assume Hillary, from her remarks, is happy with this, but of course the problem is that we’re not happy if the message, the narrative of our role, is not spun exactly, precisely as we want it, to avoid any questions, any whiff, of hypocrisy, lies, and double standard. To accuse Al Jazeera of biased or unprofessional reporting is not to see ourselves and to betray our annoyance at being unable to control others’ perspective on our policies. To say that it’s unbalanced on Palestine-Israel is to deny the permanent near (mainstream media) blackout on the brutal reality of Israel’s occupation and the facts that inform it. Everything is permissible to openly talk about, investigate, report, including Arab revolution of the acceptable kind—except Palestine. Is not the network ultimately doing what Western commentators say they want to see: a free media that relentlessly questions the prevailing assumptions, received wisdoms, and authorities? Unfortunately, satellite and cable owners refuse to carry Al Jazeera for something other than the false, benign explanation of competition with American networks, and that is fear of “real news” about Israel.